Gwyndy was formerly the servants wing of this historic country house in the village of Llanuwchllyn at "the other end" of Bala Lake. This stunning house is arranged on 3 floors with 5 bedrooms and 4 bathrooms. Gwyndy offers stylish, luxury accommodation, which is awaiting grading and fully expected to be awarded 5 Stars from Visit Wales. Ideally suited for 2 large families or several couples. 3 of the 5 bedrooms are ensuite, while 2 twin bedrooms share the 4th bathroom. Ideally the house sleeps 10 guests plus a baby in a cot, though for a supplement, it is possible for an extra 2 gueata to stay on alternative beds. Downstairs is a brand new country kitchen with breakfast bar and all the quality appliances one would expect from such a high spec property. The boot room off the kitchen houses a butlers sink, a hanging area for laundry, wetsuits and coats and safe secure storage for bikes. There is a washer/dryer, a steam iron and an ironing board. The dining room has a large table for long leisurely meals and a woodburning stove for chilly winter evenings. 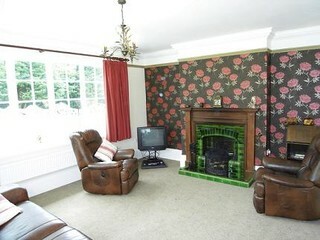 The downstairs sitting room has lots of comfy leather seating, a TV, DVD and stunning views in all directions. The first floor has a single bedroom with ensuite shower room and a double bedroom with ensuite shower room. The top floor has a spectacular master bedroom with breathtaking panoramic views across open countryside. 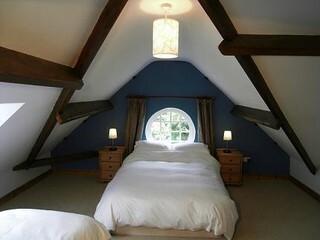 The master bedroom has a double bed and a single bed and an ensuite bathroom. There are 2 further twin bedded rooms which share a bathroom with bath tub and shower. The garden is a truly delightful setting in rolling countryside on the edge of the village. 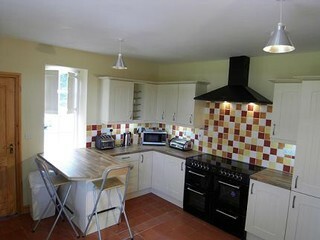 There is a barbecue, garden furniture and an enclosed patio area to the rear of the house. Guests who prefer not to drive can take advantage of the bus service to explore the local towns of Bala, 4 miles, Dolgellau, 18 miles and Barmouth, 25 miles, all of which are accessible by public transport. The Bala Lake Steam Railway runs along the back edge of the lake all the way back to Bala, and guests also love to walk or cycle this unspoiled peaceful lane. This delightful country house accommodation is perfectly placed for holidays involving watersports of all kinds, as it sits so close to the Lake and Canolfan Tryweryn, The National White water Centre. There are guided walks available around the local area and within a few minutes walk is a very popular local pub serving great home cooked meals. The mixed grill at The Eagles is legend, and a wide variety of vegetarian dishes are always available too. The Bala area is renowned for spectacular Llyn Tegid, (Bala Lake) which is the largest natural Lake in Wales. An abundance of watersports experiences are available for the asking and the area is busy all year round. Located at the southern tip of Snowdonia National Park, the Llanberis Pass is about a hour away, as are Chester, Machynlleth and Anglesey. It really is a great central point to take a holiday or short break.